Remember to call in and see us at the shop this weekend, Saturday March 5th & Sunday March 6th, as Busy Bees has a two day fabric sale (we are also putting our books in the sale, make sure you have a look). 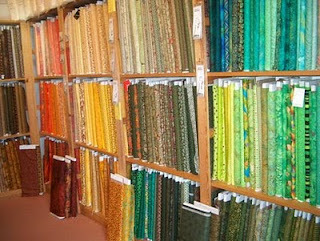 Lots of lovely fabric for you to buy at really good prices. I'm sure you will find yourself a bargain. There will also be a Remnant Sale. We have been going through the shop taking out all the bolts with less than two meters left to sell. This could be your last chance to buy the last piece of your favourite fabric that is on the bolt. It's unlikely we will be able to get these fabrics again, so get them when you can. Remember, when the sale is over, to let us know what bargain you bagged at the sale and send in a photo of what you've made. We really love to see all the quilts, bags, hangings and everything else that you make with the fabric and threads you buy at Busy Bees. The sale starts at 10am on Saturday, so don't be late.